Dubbed Blue, the two-armed bot is designed to work alongside humans and be cheap enough not to break the bank. For now, it’s a research tool. But researchers at the University of California, Berkeley — who created Blue — say its human-friendly design and artificial intelligence capabilities could pave the way for household robots that help out with domestic tasks such as cleaning, folding laundry and even making coffee. “We wanted to create a new robot that is right for the AI age rather than for the high-precision, sub-millimeter, factory automation age,” Pieter Abbeel, a professor of electrical engineering and computer science at Berkeley and the leader of the research team that built the robot, said in a written statement. That’s doubly true for robots that use deep reinforcement learning, a technique in which machines try a task over and over again until they get it right. Mistakes made by a big, powerful industrial robot can be dangerous for human and machine alike. A robot that learns by trial and error needs a gentler touch — especially in households with children and pets. 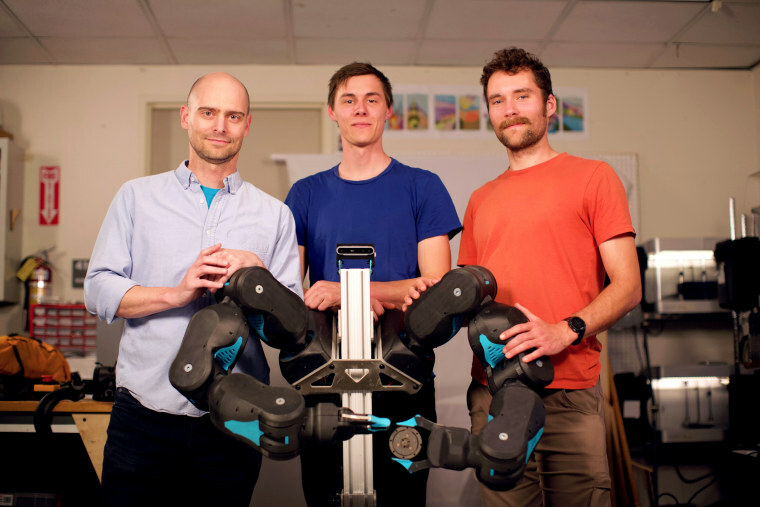 How do you make a robot that performs useful household tasks without putting others at risk? Abbeel and his team designed Blue so that it responds to touch, varying the force it exerts according to the force exerted on it. In a video showcasing Blue’s abilities, the robot gives way immediately when nudged by a human. Blue’s design is softer than those of some industrial bots. Its components are covered in curved plastic shells, with few sharp edges. Its arms, shaped roughly like a human’s, end in small claw-shaped grippers. A camera mounted between the arms like a tiny head allows the bot to take in its surroundings. Blue isn’t the first sensitive robot. But with total manufacturing costs of less than $5,000, it may be one of the cheapest. Industrial robotic arms can cost tens or hundreds of thousands of dollars. Right now, Blue can’t do too much on its own. When it folds a towel, arranges flowers in a vase and makes coffee in the video, it’s being piloted by a researcher using a virtual reality headset. And to keep costs down, it’s not as strong or precise as its industrial brethren. Selma Šabanović, an expert in human-robot interaction at Indiana University who wasn’t involved in the research, said the arm wasn't quite ready to take over your chores. “[Blue] is more for use by the robotics community as a research tool than directly for home users,” she said in an email. Šabanović added that Blue’s low price tag will make it more accessible for researchers and teachers, possibly leading to more and better research on domestic robots. In the meantime, it looks like we’ll be doing our own laundry.